So why exactly would I bore my readers with stories of a horrible book? Because it had one redeeming quality. Pictures. Wow, don’t I feel like a child, saying the only good part of a book was the pictures. But the pictures, they were good, and I figured I’d share with you all. Let’s “read” this book, together. And when I say read, I mean look at the pictures, and ignore all the snooze-inducing text. 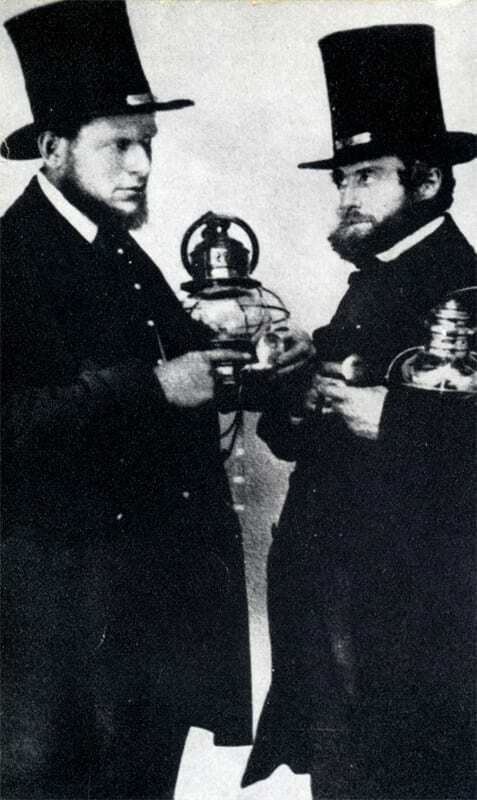 1864, Michigan Southern & Northern Indiana conductors (or perhaps Abraham Lincoln impersonators). 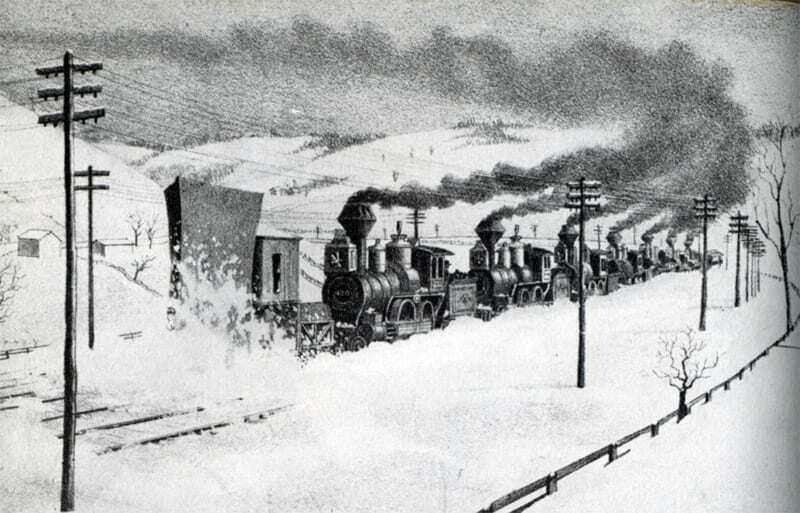 1877, Train with snow plow during a snow storm. 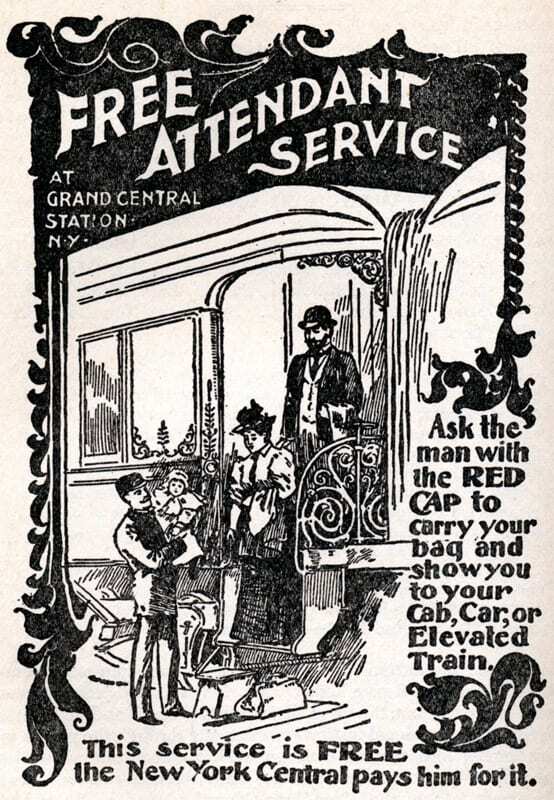 1896, First advertisement of Red Cap service. 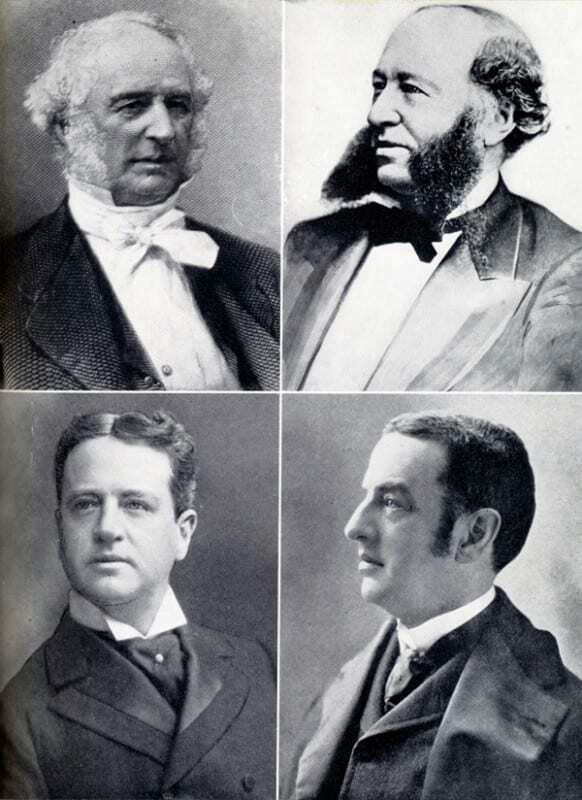 The Vanderbilts: Cornelius, William Henry, William Kissam, and Cornelius II. William Henry wins bonus points for having the most spectacular facial hair in the family. 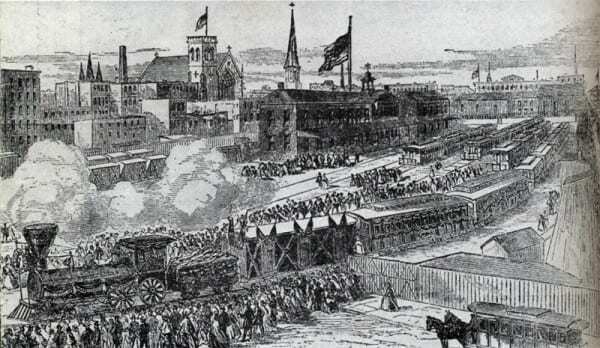 1865, President Lincoln’s funeral train. 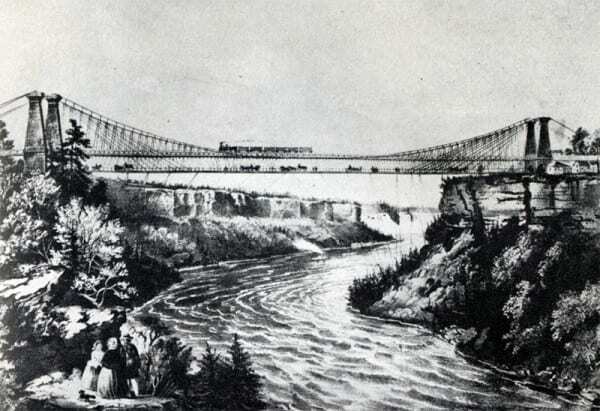 1866, First bridge across the Hudson at Albany. 1870, A New York & Harlem snow plow. 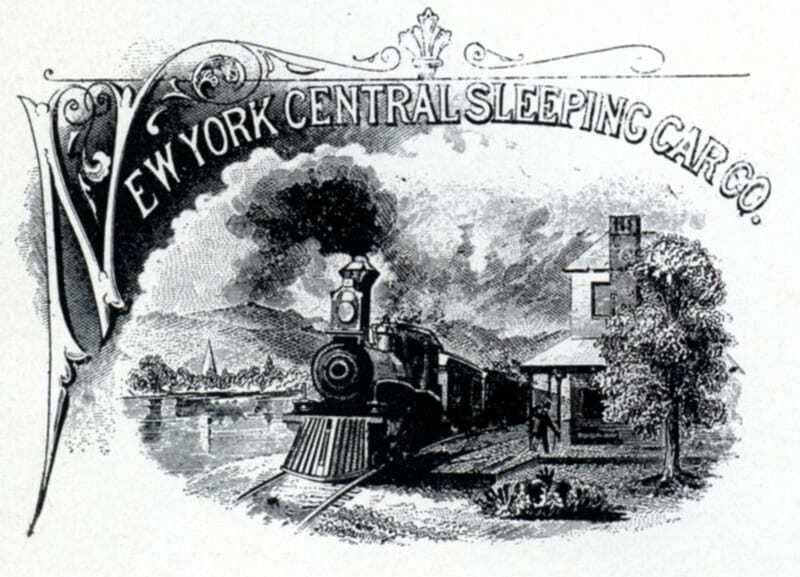 1870’s, From a dining car menu. 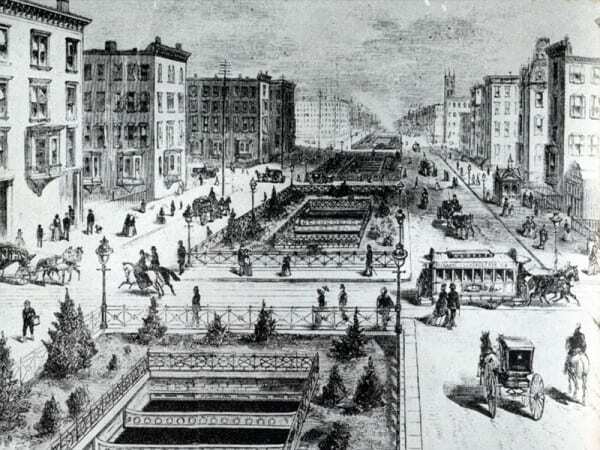 1870’s, Park Avenue, with the railroad running underneath. 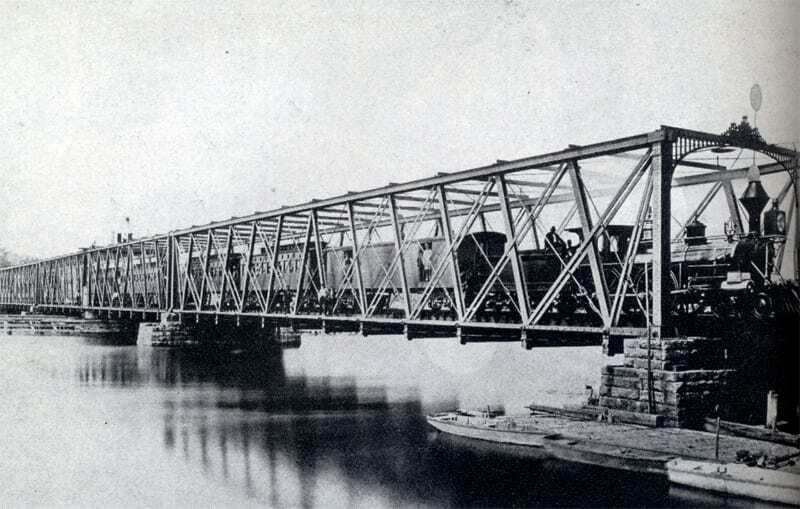 1875, Railroad bridge over the Harlem River. 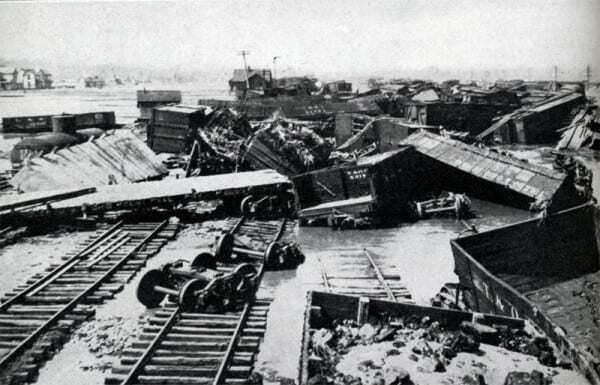 1876, The locomotive Columbia, lost in the Ashtabula Disaster. 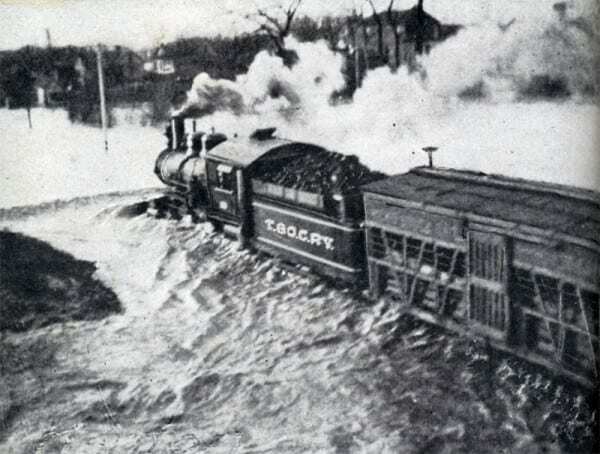 1889, Freight train in a flood. Michigan Central train passes by Niagara Falls. Empire State Express Number 999. Train crossing the main street in Syracuse. 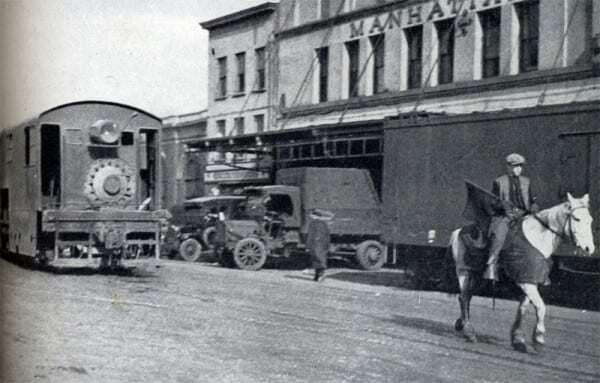 Freight train on Eleventh Avenue in New York, preceded by a red-flagged herald on horseback. 1913, West Columbus during the flood of 1913. …and that just about wraps up our read of “The Road of the Century” … or at least the graphically condensed version. If you ask me, that picture of the conductors made everything worth it. Great work here. One question about the photos. 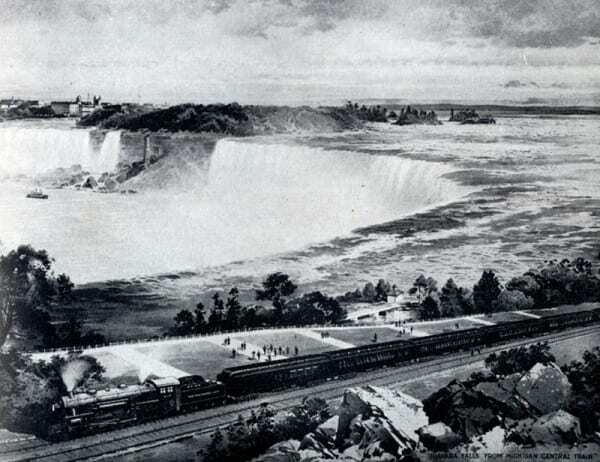 The Michigan Central train passing by Niagara Falls. It looks like it is on the Canadian side of the Falls. Was it really there…or is this just an artist’s rendition? 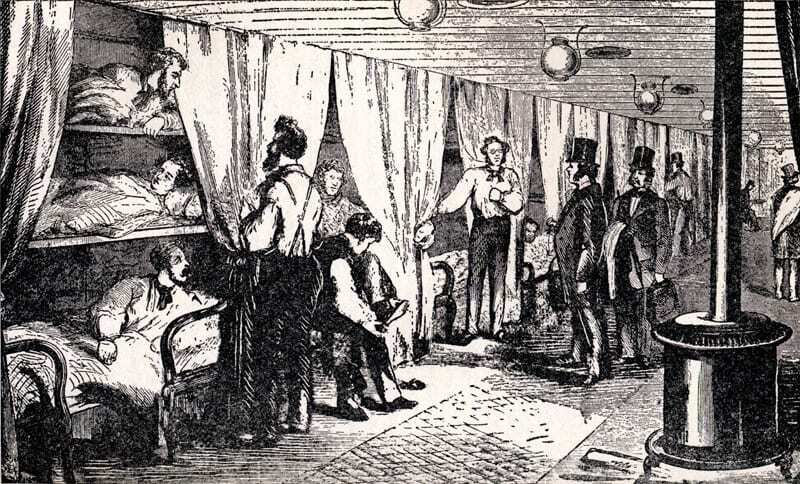 Correction: it does appear to be an illustration. Your comment made me think that when I am up by Niagara I should check if there are any rail museums. 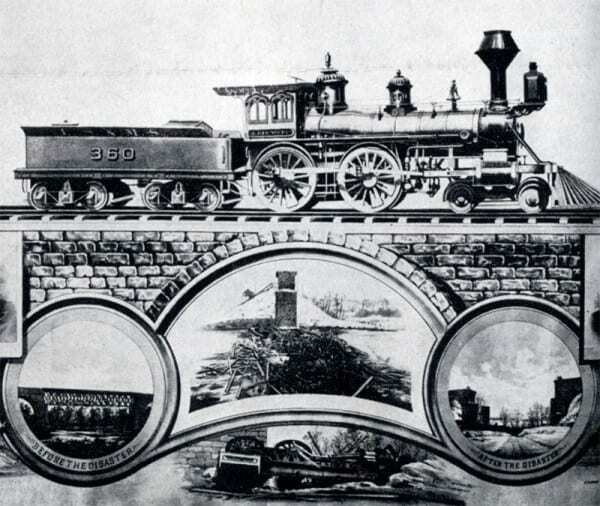 I found the Niagara Falls Railway Museum, and to my surprise on the front page was that same image in question (from a postcard), except in color. They say of the image, “This particular example portrays the Horseshoe Falls, the American Falls, a Maid of the Mist boat and a steam powered Michigan Central freight train stopped at Fallsview.” The postcard in their collection has a mail date of July 23, 1941. The illustration shows a Michigan Central passenger train stopped at Falls View Station just west of Horseshoe Falls. I believe the artist was commissioned by the railroad to produce this image, which was accurate for its time. 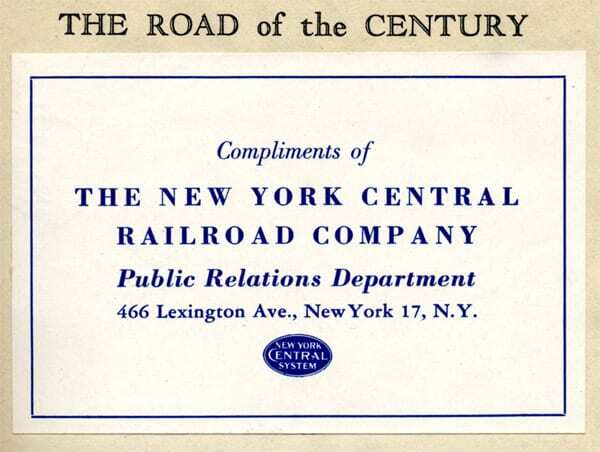 I have seen an ad in an old MC – NYC timetable that offered framed reproductions for sale. From 1872 until 1925, it was the railroad’s policy that all daylight passenger trains on this route would make a 5 – 10-minute stop at Falls View (also known as Inspiration Point) so that passengers could get out and see the Falls from a spectacular elevation. Falls View was not a ticketed destination, nor was it a departure point for passengers to board a train, so that the Station grounds may have been rather exclusive. The Michigan Central Railroad advertised itself as “The Niagara Falls Route”. The Michigan Central Steel-Arch Bridge still extends across the Niagara River Gorge north of the Falls. Completed in 1925, it is now abandoned and rusting away. 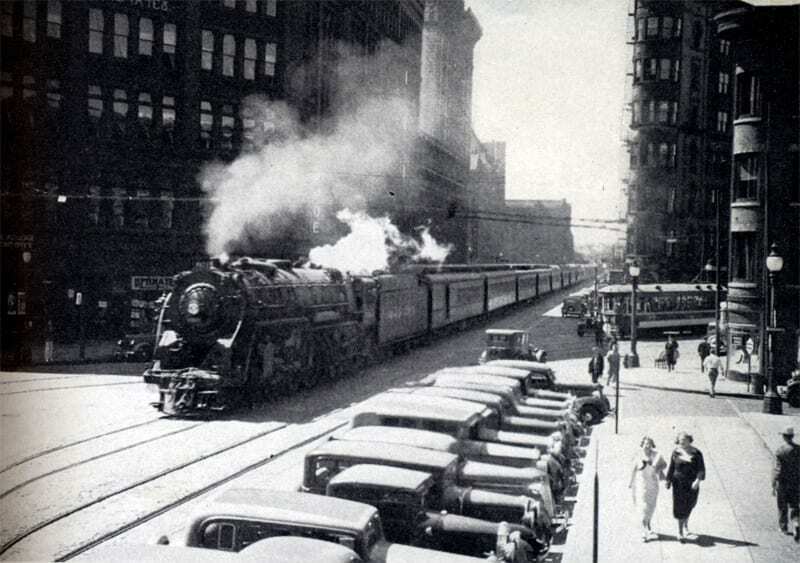 Michigan Central sent its first train through the Detroit River Tunnel between Windsor, Ontario and Detroit, Michigan in July, 1910. The tunnel, now owned by Canadian Pacific Railroad, is 100 years old and still in service. The western approach to the tunnel curves past Detroit’s abandoned but still-incredible Michigan Central Terminal (1913).